Key difference: DDR4 is the newer generation DDR that replaced DDR3. As compared to DDR3, DDR4 has a lower operating voltage, increased power saving enhancements, as well as increased efficiency and improved chip density. Basically, it is faster and consumes less power. DDR3 and DDR4 are two different types of RAM that are commonly used in computers and laptops. RAM stands for Random Access Memory and is what stores the operating system (OS), application programs and data is stored for faster access. This allows the computer to boot up faster and access this stored data faster than it would be able to if this data was saved in the hard drive. RAM is essentially why computers today tend to be able to boot up so much faster than in the initial days. However, RAM memory is temporary, which means that when the computer is shut down, the RAM is cleared, hence deleting any information that the user may have stored in it. At shut down, all data in the RAM should be moved to the hard drive, either automatically as part of a process of or it will be deleted. When the computer is turned on, the necessary files are copied from the hard drive into the RAM and kept there until shut down. DDR stands for Double data rate. It is a type of synchronous dynamic random-access memory (SDRAM) and has a high bandwidth interface, hence the name, "double data rate". DDR3 and DDR4 are two types of DDR SDRAM. The numbers in the name refer to their generation, i.e. their place in the line of succession. 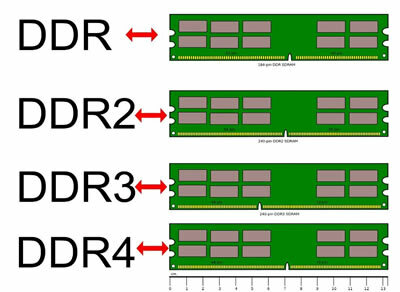 DDR was succeeded by DDR2, which in turn was followed by DDR3, and then came DDR4. As a successor to DDR2, DDR3 is a lot faster, whereas DDR4 is even faster than DDR3. DDR3 can clock speeds between 800 and 2133 MT/s (million transfers per second), whereas the speeds of DDR4 start at 2133 MT/s and can go up to 4266 MT/s, which is significantly faster than DDR3. Officially, DDR4 does not have a top speed, or even if it does, programmers have yet been unable to reach it. They continue to push its boundaries. Additionally, DDR4 has a lower operating voltage, as compared to its previous generations. It uses a maximum of 1.2 Volts, and a minimum of 1.05 Volts, while DDR3 uses a maximum of 1.5 Volts and a minimum of 1.35 Volts. DDR4 also has increased power saving enhancements. It includes a new deep power – down mode that reduces power consumption when the system is in standby. This reduced power consumption in addition to lower operating voltage also results in the DDR4 drawing less power and running cooler than DDR3. DDR4 also showcases increased efficiency and improved chip density. DDR4 chips are manufactured in densities of up to 16GB. This is almost twice the density of DDR3. This will allow the user to install and use up to 16GB per stick. However, it should be noted that DDR4 can only be installed on motherboards that support DDR4, as it tends to have more pins that DDR3. DDR4 has 288-pin dual in-line memory modules (DIMMs), that are spaced more closely so that the pins can fit in the same 5.25 inch (133.35 mm) standard DIMM length. However, its height is increased slightly to 31.25 mm/1.23 inch from the 30.35 mm/1.2 inch of DDR3. In comparison, DDR3 has 240-pin DDR3 DIMMs that are spaced at 1.0 mm. Additionally, DDR4 SO-DIMMs have 260 pins instead of the 204 pins of DDR3 SO-DIMMs. These are spaced at 0.5 rather than 0.6 mm of DDR3, and are 2.0 mm wider, resulting in 69.6 mm versus 67.6 mm in DDR3. However they are still of the same height, i.e. 30 mm. 240-pin module. SO-DIMMs have 204 pins. 288-pin module. SO-DIMMs have 260 pins. Spaced closer together than DDR3.